It’s that time again – time for thousands of high school juniors to take the ACT test in hopes of securing a score high enough to help open doors at desirable colleges and universities across the country. If you’re reading this, you’re probably well aware of the test basics – students must complete four mandatory tests in the subject areas of math, science, English and reading, with the option of completing a fifth voluntary writing section, if necessary. You’ll then get a score between 1 and 36 for each section, followed by an overall composite score that’s an average of the four mandatory individual test scores. The optional writing test won’t affect your overall composite score, but many colleges require that applicants complete this section. So, unless you’re 100 percent certain that you plan to attend a school that doesn’t require the writing section, it’s probably in your best interest to at least take a stab at it. While there are countless ways to prepare for the test, none are as likely to help you calm your nerves as those that give you an opportunity to familiarize yourself with the test’s look and feel. ACT For Dummies, 5th edition, written by yours truly, contains three complete practice tests modeled after the most recent versions of the ACT test. We also supply you with corresponding answer explanations. The Premier Edition includes a CD that contains the three complete tests – plus two additional ones – and computes your score for you, which can be monumentally helpful in terms of identifying areas that you might want to spend some additional study time on. ACT For Dummies, 5th edition, is available for purchase at a reduced rate of $19.99 on our website, a savings of nearly 35 percent off of the regular MSRP retail price. This sale price will be available through the next ACT test date of June 9th – the last opportunity for juniors to take the critical test. 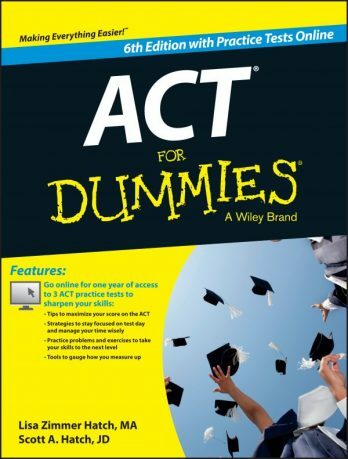 As always, please feel free to contact us with any and all ACT-related questions, about ACT For Dummies or otherwise….remember, we wrote the book on it!